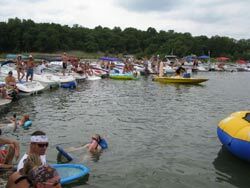 For the last few years, every August, usually the third weekend, we head to Eagle Mountain Lake for the annual Tie Up. 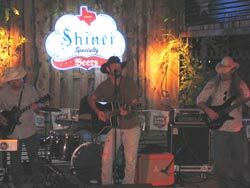 We started this weekend a little early by spending Thursday evening at Love & War in Texas (Plano) for the start of the Shiner Rising Star Contest. This is similar to a battle of the bands event that culminates after several weeks of eliminations in the winning band receiving a contact for a new CD. This Thursday three bands competed in the first round on their way to a record contract. 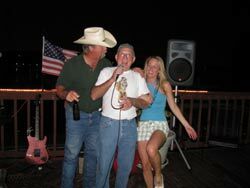 Love & War is one of our favorite music venues and the perfect place to enjoy a great outdoor patio, good food (try the Chicken Fried Chicken - best in Texas), excellent frozen margaritas, cold beer, and a fun crowd. Friday on our way to Eagle Mountain Lake for the annual “tie up” we stopped at Iron Horse Golf Course in North Richland Hills for 18 holes of very fun golf – although, I don’t know how we could have had so much fun when our golf game sucked! Iron Horse is a very good course and if you're in the area, stop by and play 18. To learn more, read our review of Iron Horse Golf Course. We spent Friday night on Eagle Mountain Lake at Creek Harbor Fish Camp. 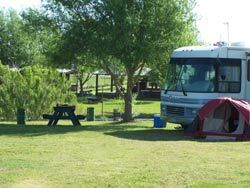 This is one of a very few places we have found that offer cabins (very rustic) and campsites for tents and RVs. We stayed in one of the rustic one room cabins - two beds, a small table and AC. 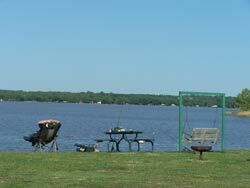 This is not your Hilton on the Lake, but the beds were comfortable, the price is right, it's on the lake, and has a boat ramp as well as overnight boat parking. Check our review of Creek Harbor Fish Camp. Before turning in for the evening, we boated over to Scampi's Cove for some food and music. 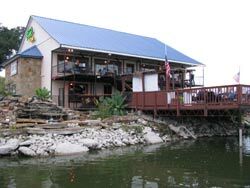 Scampi's has an awesome patio overlooking the marina and lake and typically has a band or karaoke on the deck. 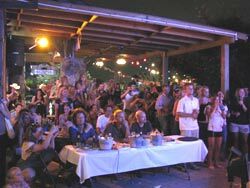 The crowd is a mix of locals and boaters and they are out to have a good time eating, drinking, singing, dancing, and socializing. On this visit, Kelly’s had a good karaoke DJ who played guitar and sang. Some of the locals had very good voices and some of the others should stick to singing in the shower, ALONE. The placed was packed and it was fun dancing, watching the crowd, and enjoying a beautiful evening on the lake. Boating home with smooth water, some good tunes on the radio, and a full moon ended a perfect day – plus we miraculously navigated our way right to the campground with no wrong turns or mishaps! 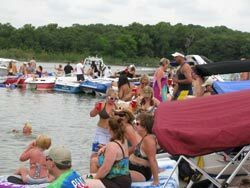 Saturday we loaded the boat with food and drinks and headed over to the cove for the annual Eagle Mountain Lake “tie up.” We got there about 12:00 and there was already a wild party going on with about 75 boats of all sizes rafted up together in a semi circle. By 1:30 the circle of boats was complete with over 150 boats all rafted together. In the center of the circle was a DJ with some huge speakers. Shortly after the DJ started blasting a variety of tunes, the dance contest started on the DJs boat with Scampi’s Cove wait staff in a heated dance contest against the Miller Lite ladies and the Eagle’s Nest Sports Bar wait staff. Looked like a tie to me. Dancing (including ladies from some of the other boats) and music plus free koozies and tee shirts continued the rest of the day. 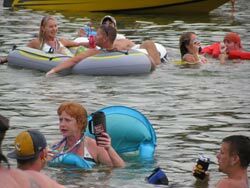 Just about every boat that is rafted together is loaded with people, food, beads, water toys, and lots of stuff to drink, including bongs and jello-shots. 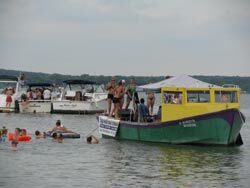 In addition to the DJs music, quite a few boats are blasting a variety of tunes from their boats as well as having mini dance contests on the boats. What great people watching! 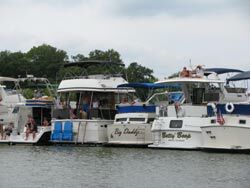 Guys and gals (of all shapes and sizes) plus some pets walk or swim from boat to boat, sharing drinks, jello-shots, water toys, laughs, and tall tales. 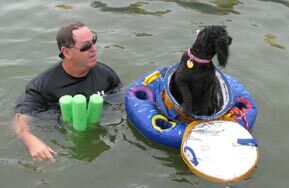 You’ll find the crowd using all sorts of toys to keep afloat and to get from boat to boat or to the DJ’s boat – everything from waverunners, kayaks, inner tubes (some of which are reserved for drinks), flippers, life jackets, a variety of floaties, and gas propelled scooters. The people watching is fantastic and the crowd is friendly and out to have a good time. As you float or swim, you’ll meet a lot of people and share a lot of giggles. In fact, you’ll meet quite a few people as they traverse the bow or stern of your boat moving from boat to boat to meet some friends or make some new ones. This is not a kid friendly event and if you’re against various levels of nakedness and drunkedness, then stay away from this event. The DJ usually leaves around 6 and the boats slowly start to head home. A number of boats spend the night in the cove and one very slow moving guy we met the next morning said he stayed in the cove until 4:30 AM! We walked past his boat early the next morning and it looked like a garbage scow as it was littered with beer cans, empty jello-shots, floaties, and more – as a matter of fact, he didn't look that great either. Around 7:30 PM, we left the tie-up and headed for The Spot for an appetizer and then to Scampi’s for dinner and karaoke. Scampi’s had a nice mix of locals and some of the boaters from the tie-up. Unfortunately, a storm started to move in and the drizzle sent a lot of the crowd home or kept them away in the first place. After enjoying some food, more drinks, and good people watching, we headed back to the cabin. On Sunday before hitting the road for home, we played 18 holes of fantastic golf (not because we shot well!) at The Golf Club @ The Resort. 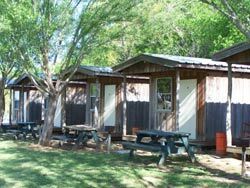 The Resort is just south of Creek Harbor Fish Camp and is a very well done golf course and lake side community with some big homes and nice amenities. 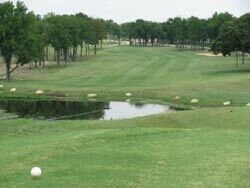 The course offers golfers a little bit of everything that we like in a golf course – lots of variety, some very pretty and challenging holes, good conditions, plenty of dog legs, traps, and water hazards. This course requires good club selection and excellent course management skills if you want to score well. 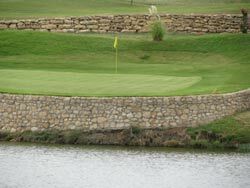 To learn more, read our review of The Golf Club @ The Resort. What a fun filled weekend. Why not join us next year!